Wes Anderson’s films often use banal items to unexpected ends—like the Adidas tracksuits that serve as Chas Tenenbaum’s family uniform in The Royal Tenenbaums—but in many cases, the ephemera of the real world aren’t distinctive enough for the director. That’s why the Anderson oeuvre is filled with invented objects that reference an authentic sensibility, but exist in a realm of heightened idiosyncrasy. The Khaki Scout troops of Moonrise Kingdom, for instance, may parallel the actual Boy Scouts, but the activities of the Khakis are decidedly more twee and fanciful. A case in point: Scout Master Randy Ward (Edward Norton) sports a “Leaf Observer” merit badge, presumably earned after so many hours of staring at trees. It’s hard to imagine a practical application for leaf-observing skills that have been honed to badge-worthy levels, and that’s just the point: It’s the task that matters, not the purpose. Ward is an unassuming, slightly skittish fellow who takes solace in the rules, routines, and traditions of Khaki Scout culture. For him, scouting is an end to itself—a refuge from the seriousness and real stakes of normal life—which makes it all the more traumatic for him when young misfit Sam Shakusky disappears and introduces life-or-death tensions into the idyll of scouting. The “Leaf Observer” badge evokes the comfortable bubble of Ward’s scout master worldview more poignantly than any authentic badge ever could. The titular Mr. Fox (George Clooney) may have fantastic aspirations, but his supporting cast is content to live a more sedate existence. Nonetheless, Fox’s charm and enthusiasm lure otherwise ho-hum characters like Kylie Sven Opossum (Wallace Wolodarsky) into his larcenous schemes. During one of Fox’s attempts to infiltrate a nearby farm, we catch a glimpse of the life that Kylie, the semi-willing accomplice, is used to living. When Fox asks for a credit card, Kylie hands his over, and it’s a World Traveler Titanium Card. “How the cuss did you qualify for this?” Fox demands. Kylie shrugs and says, “I pay my bills on time. I’ve always had good credit.” It’s not much of a story, which might be why Kylie tags along on these adventures despite himself—at least they give him a story to tell. But that dynamic cuts both ways: Fox needs a steady sort like Kylie to keep him grounded and to provide support. And Fox is also prone to blithely exploit his friends, as we see when he takes the credit card—the opossum’s reward for level-headed good citizenry—and uses it to pick a lock, promptly getting the whole crew into even deeper trouble. 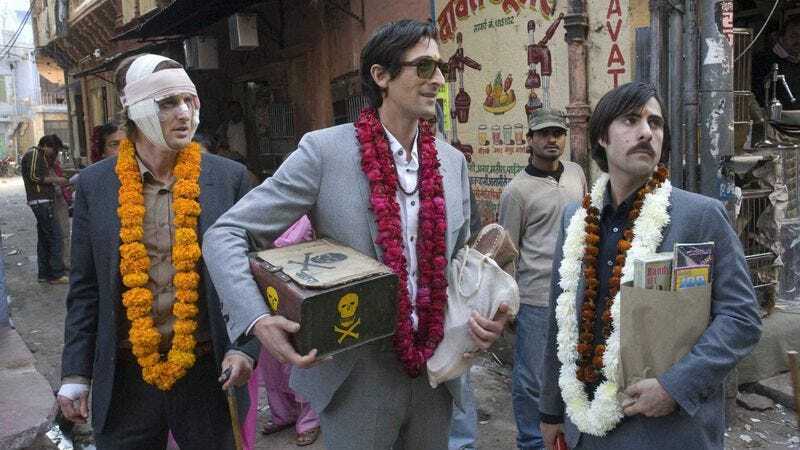 The three Whitman brothers in The Darjeeling Limited each cope with personal pain in their own ways. Francis (Owen Wilson) tries in vain to assert control over every detail of his existence. Peter (Adrien Brody) sulks and sleepwalks through the day. And Jack (Jason Schwartzman) pours his anguish over a failed relationship into thinly veiled autobiographical fiction. All three of them are united, though, by a lingering sorrow over their father’s death and a refusal to view the world with clear eyes. As they begin their train trip through India, the men come prepared with medication to maintain their haze, each with its own Andersonian name. Peter’s Hypno-Aid pills are “some kind of Indian muscle relaxer,” and Jack’s Narco-Cough is “an Indian flu medicine” that’s “got a tranquilizer in it.” Francis trumps them both with Opio-Sedate, purportedly India’s strongest painkiller. The brothers’ painkillers, like their pain, are different in the specifics, but the same in general. And all of the characters disregard the advice to medicate themselves one drop at a time. The members of Anderson’s quirkiest on-screen family, the Tenenbaums, are replete with oddities, but middle daughter Margot (Gwyneth Paltrow) is an outlier in a clan of outliers. Commonly referred to as “my adopted daughter, Margot” by her father, Royal (Gene Hackman), the most mysterious Tenenbaum uses her wooden finger to rap impatiently on bathtubs and intimidate those around her. It’s only after her brother Chas (Ben Stiller) and his sons come back into her life that we discover what happened to her right ring finger: While visiting with her biological family at their farm, she loses it chopping wood. Along with a secret marriage and a brief stint writing plays in France, Margot’s wooden finger is an eternal wound, tangibly evoking the reality that she will never quite be complete—never truly a Tenenbaum. It’s an accouterment that heightens the mystique of a troubled and heartbreaking character. Beneath the heist-and-escape plot of Fantastic Mr. Fox is the sweet story of a father reconnecting with his son. Mr. Fox is tall, athletic, charming, and downright debonair. His son Ash (Jason Schwartzman) is not: He’s short, clumsy, and lacking in social graces. In other words, he’s… “different.” With the arrival of Kristofferson (Eric Chase Anderson), a cousin of Ash’s age with Mr. Fox’s gifts, those father-son tensions come to the front. Fox invites the new lad to go thieving with him, complete with stylish black mask. But Ash shows up to help as well, wearing a less-than-stylish white tube sock with holes cut out for his face. At first, it’s the perfect embodiment of Ash’s desire to be like his dad and his awkward failure to do so. But by the time the film reaches its climax and Ash becomes an unlikely hero, that tube sock mask has become a celebration of Ash’s geeky enthusiasm. Although they’re barreling down the road to criminal infamy, the heroes of Anderson’s first feature film, Anthony (Luke Wilson) and Dignan (Owen Wilson), live on a tight schedule. Dignan, the wannabe criminal ringleader, never lets go of his trusty spiral notebook, which is dedicated to a hilariously detailed 75-year plan. This long-term road map lays out a life in which Dignan and his accomplices will evolve from their first heist into a full-scale criminal enterprise. Once he retrieves Anthony from a psychiatric hospital at the beginning of the film, Dignan describes how they’ll first practice a job and then sharpen their timing as they learn to make errors in a safe rehearsal environment. The plan is thorough: It instructs the boys to “develop outside interests,” including “travel, art, and science,” and advises a hiatus from a life of crime for “wives and family—very crucial.” If you look closely, the plan also contains various self-assured, tongue-in-cheek notes Dignan jots. In the final section, “Living Into The 21st Century,” he writes: “Anthony, as you know there can be no way of looking this far ahead, so 1. Remain flexible and 2. Don’t be too derogatory.” Utilizing the plan, the guys muddle through an unsuccessful life of crime in which they don black leather gloves, practice looting on Anthony’s own house, and attempt to rob a bookstore after pretending to leave a jacket there. When the Whitman brothers take a break from their train trip to browse a small bazaar, Peter Whitman’s eye is drawn to a snake that the vendor characterizes as “very poisonous.” Despite the warning—or, in all likelihood, because of it—Peter buys the snake, and with it he acquires an odd, ramshackle container for the deadly animal. The box’s most striking detail is a hand-painted skull and crossbones, which depicts a long, slender head and high-set eyes. It bears a resemblance to Peter himself, which drives home the notion that the morose Peter is preoccupied with thoughts of his mortality—he is essentially buying a vision of his death (and an instrument of the same) to look at on the train. The snake box is a quintessential example of Anderson’s ability to hint at deep meaning with a subtle visual detail. Max Fisher, expertly played by Jason Schwartzman in his feature-film debut, would be the epitome of an overachiever if it weren’t for his lousy grades. Even without a “Making Time”-backed montage of Max’s abundant extracurricular activities, it’s evident that the prep-school student has hopes of greatness—or at least enjoys the trappings of greatness. Take his Rushmore Academy uniform, which is a step above the rest of his peers, topped off with a maroon beret. It’s the custom lapel pins, though, that most speak to Max’s character. His Perfect Attendance and Punctuality pins are clear overcompensation. Max fully embraces the pseudo-poshness of his private school and casts himself not just as any privileged adolescent strolling through the hallowed halls, but as the ultimate privileged kid—instead of the scholarship student he is. Donning these pins is an attempt to one-up those around him and to assert a status he will most likely never obtain due to his working-class roots. Blueblood or not, those lapel pins are dapper. Anderson’s self-financed short film “Hotel Chevalier” began as a separate project from The Darjeeling Limited, but when the director recognized similarities in tone, he made the short a prologue elucidating the backstory of Jack Whitman’s romantic despair. Jack’s ex-girlfriend (Natalie Portman) is a cross between a Manic Pixie Dream Girl and an agent of chaos, hunting Jack down at his Paris hotel and throwing him into emotional turmoil before gallivanting off again. Right after she shows up in “Hotel Chevalier,” Anderson’s camera takes a top-down view of her slipping a small brown package into Jack’s suitcase. In The Darjeeling Limited, it’s revealed to be a bottle of her Voltaire #6 perfume, a way to wriggle into his thoughts with an aroma while she is away. Jack’s brothers, in an attempt to mitigate his melancholy, advise him to get rid of the bottle. He half succeeds: Instead of tossing it out the window, Jack smashes it with a flashlight, which saturates the train compartment with her scent, a representation of her continuing ability to infiltrate his senses even without her physical presence. Young Ned Plimpton (Owen Wilson) spends much of his life believing that his father is the famed aquatic explorer and filmmaker Steve Zissou (Bill Murray) in Anderson’s fourth feature film. The connection between fathers and sons—and father figures and surrogate sons—weighs heavily on Life Aquatic. It’s at the forefront in every scene that features Ned, as embodied by a ring Ned wears at all times. He got it from the Zissou Society, a fan club of which he’s been a member since childhood. Bearing the insignia of Team Zissou, it’s a way for a boy who never knew his father to keep a piece of him around at all times, and it gains added poignancy in the film’s final act, when several revelations and plot developments test the bond that Ned and Steve have built. Invented by Chas Tenenbaum as a child, the Dalmatian mouse is a novel breed of rodent that’s a little bit quirky without being too threatening. The mice have been allowed to roam free and go about their mousey business in the Tenenbaum home for years, not unlike Chas and his sons, Ari and Uzi. The mice are also a constant reminder to Chas that, like the rest of his siblings, he used to be extraordinary, creative, and smart—and that, maybe, if he can move on from the death of his wife, he can recapture some of his old joie de vivre. Toward the end of the movie, the mice are symbolically replaced by Sparkplug, the Dalmatian dog, who—along with Ari, Uzi, and family patriarch Royal Tenenbaum—actually leaves the house and experiences adventure outside the safe-but-stifling confines of the Tenenbaum home.